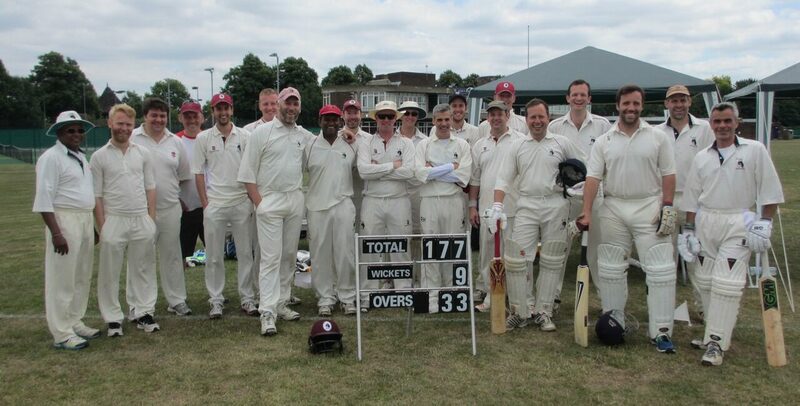 The Whalers convened at Kings House hoping to get back to winning ways after three rather heavy defeats in a row. With an obligatory struggle for numbers they would have to do this with 9 men (including a loaned player John) however it was a strong 9 packed full of Whalers all-rounders. Although a hot sunny day heavy overnight rain had left the wicket a little soft so after Jack lost the toss again we were invited to bat. As our only two ‘recognised’ batsmen Dean and Pip were chosen to open, Jack then seemed to have a little more difficulty with the rest of batting line-up…The Exiles opening bowlers were fairly accurate and on a slow pitch both batsmen started off in a solid fashion although Dean still punished the couple of short balls, pulling them for fours. The change bowlers were also very steady and Dean & Pip continued at around 4 an over reaching drinks at 74-0. The solid base had been set and when a fifth bowler was introduced Dean took a real liking to him and scoring rate immediately increased. Some big overs (including a 23) followed and before long we were celebrating another 50 for Dean and then a 100 first wicket partnership. The Exiles then introduced their secret weapon, an 11 year old bowler (Bradshaw Jnr). He bowled a tidy line and length and both Dean & Pip suddenly seemed very circumspect, not wanting to lose their wicket to the youngster. Pip bought up his 50 before becoming the first victim of said 11 year old, being bowled trying to force on through the leg-side. Khalil was the ‘all-rounder’ chosen to bat at 3 however he only lasted a few balls before skying one off the bowling of Hussain for a duck. After remarking to the umpire that due to the loss of two quick wickets he would now look to consolidate Dean then had a big slog and was bowled by Hussain two balls later……Geoff and Matt were the new batsmen however Geoff departed almost immediately as the second wicket of the 11 year old, hitting a slow long hop straight to Cow Corner. From 147-0 the Whalers were suddenly 155-4 (a remarkably similar collapse to England’s earlier in the day). Dan joined Matt still with almost 9 overs left and on a good pitch with plenty of space in the outfield they were still a fair way short of a competitive total. Cue an all run partnership of 53 which came to an end with Matt being bowled for 36 off the last ball of the innings. Not being able to time or hit the ball hard enough to reach the very long boundary Matt hit 4 all run fours (including 2 in one over) plus 2 threes and multiple two’s and in the process turned bright red and needed an extended lie down at tea. The hard running had got the Whalers to a competitive total of 208-5 off their 35 overs however. Khalil and Jack opened the bowling and both started well. Jack took the first wicket in his second over, finding the edge of Bradshaw Snr’s bat with Pip taking a very smart catch in the gully. Hussain came out next and it didn’t take him long to get going with a big six off Jack and some wristy flicks off Khalil. The other opener Roberts was much more circumspect however and survived numerous LBW appeals (at least 4 bowlers were convinced they had him plum). Dan & Geoff were now bowling and Dan had Hussain LBW only for him to be called back when it was judged that he had hit it first. The bowling was still very tight however and at drinks the Exiles were on 59-1. This meant they would need 150 off 18 overs at a touch over 8 an over so would need to up the scoring rate. Roberts was out shortly after drinks, a genuine edge being caught by stand in keeper John off Dan’s bowling. Number 4 Alouysius didn’t last too long before having his middle stump removed again by Dan. Hussain at the other end was still scoring however and after he was dropped by Matt off Geoff’s bowling Geoff took matters into his own hands a couple of overs later catching an enormous skier from Hussain off his own bowling. A double switch of bowling then bought Kamal and Matt into the action. Now recovered from his batting and utilising his new 3 step run up Matt took a wicket with his first ball as Muskatel hit one straight to the covers for Geoff to take a juggling catch. Matt had another one next over with Wingfield picking out Khalil at mid-off for a straight forward catch. Kamal was also causing problems at the other end and had Ahmed caught by Dean at mid-off and Patel caught by Dan at square leg. With wickets continuing to fall and the run rate not increasing Geoff was bought back to bowl the penultimate over with the Exiles still needing 80. After a few big swishes Ling played on to the last ball of the over which left Kamal to bowl the final over at Number 10 batsmen Patel and Bradshaw Jnr. Bradshaw Jnr was clearly very keen to have a bat and somehow took a run when Patel hit it straight back at Kamal. He did end up getting a single with the Exiles finishing on 137 for 9 giving the Whalers a 71 run victory in an excellent all round performance. This entry was posted in Uncategorized on May 29, 2018 by whalers1.